Your reputation is everything! It affects your career, business and life. 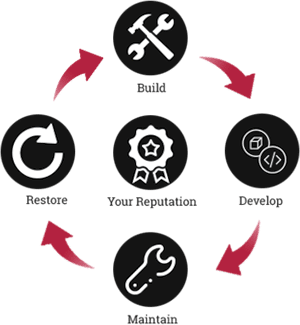 We can help to fix any damaging reputation issues, either online and offline using our Reputrak 360™️ program. Reputrak 360™ – The IGI Reputation Management System™ is a proprietary software program that follows a practice of monitoring the reputation of an individual and business brand, addressing online content which are damaging to it and using numerous white-hat feedback solutions to get early warning signals of reputation problems. An integral part of this system is focused on pushing down negative search results in the digital world followed by a strategic real person manual advocacy campaign to re-position the brand in the offline world. The IGI Reputation Management System™ attempts to bridge the gap between how the individual or business perceives itself and how others view it. Do you have an effective reputation management action plan? Do you require support with your digital reputation? Do you require support with your offline reputation? Do you have a reputation risk and crisis plan strategy? Do you require an online (digital) makeover? Do you need strategic reputation management advice? To build the solid foundations on reputation management for individuals and business. To advance the reputation of the individual and business as per the strategic objectives. To maintain the good reputation of the individual and business in the public eye. To restore the public image of an individual and business to a former positive brand image. The system is supported by IGI’s offline reputation experts and includes Legal, Financial and Media specialists.